I’ve been away for awhile for a variety of reasons–haven’t looked at the comments, haven’t checked the site’s e-mail account, haven’t looked at the Twitter feed. I knew I’d come back, but I hate having to come back for this. The interviewer is kinda corny, but Darwyn is his usual charming self and you get to see footage of him brush-painting the ComicCon exclusive edition of The Score. It’s less than five minutes if you’re sneaking this in at the office. Some hiatus, huh? Well, just because I’m somewhat limited at the moment doesn’t mean I can’t throw up a quickie every now and again. Darwyn Cooke does one in-depth interview for each volume in his series of comic book adaptations of Richard Stark’s [pseudonym of Donald Westlake] Parker novels. (Here are the interviews for The Hunter and The Outfit.) 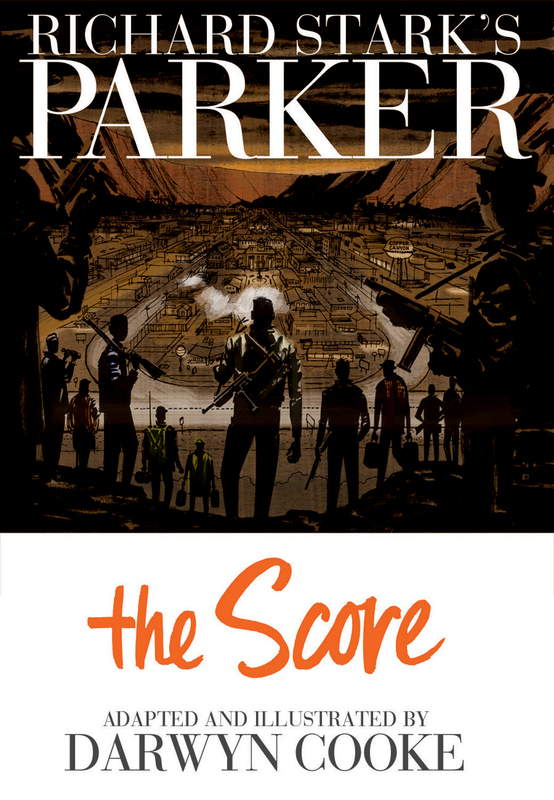 For his new one, The Score, he was kind enough to invite The Violent World of Parker to conduct the interview. “I thought it was time I geared whatever big interview I did more towards Don’s [Donald Westlake’s] fans, rather than my own,” he told us. For better or worse, he got what he asked for. Nick and I managed two conference calls with Darwyn across three countries, three time zones, and two continents. Thank you for sitting down with us, Darwyn, and thank you for your immense contributions to the violent world of Parker, and to The Violent World of Parker. Dear reader: Dig in. I think you’ll find it as fascinating as Nick and I did. Nick: [Opening after some green room chatter] Speaking of The Score: How was it this time? How did you find it? How did you adapt to it this time out? Darwyn: There’s sort of a built-in need to find a way to make each one better than the last. That usually adds to stress and anxiety and all sorts of things you can’t control, but the more I work with Parker, the more comfortable it gets. It’s a pretty easy ride now. I know how I feel about the character and I know how people have reacted to it, so I feel really free just to go ahead with it? And, in every case with Parker I’m just out to please myself. And that happens to be pleasing other people, so that’s great. I’m never sitting there worrying about what it is I’m doing. It’s just a very comfortable, really gratifying job now. Update: This review is a first draft. The current version is here. I believe this is also the debut of the cover art for The Outfit. Fellow Parker fan James picked this up for me at WonderCon a few days ago. Pretty great! The Violent World of Parker gets a hat tip in the introduction! Thanks, Darwyn! The Man With the Getaway Face will be available at comic shops in July.